Subject wise Qualifications for TS KGBVs PGCRTs Recruitment 2018, Qualifications for Vocational Courses (Health & Para Medical), Educational Qualifcations for the Post of PGCRT Only Female Candidates to apply. TS KGBVs PGCRTs Recruitment 2018 Post wise Qualifications, TS KGBVs Post Graduate Resident Teacher (PGCRT) posts Recruitment 2018 Educational Qualifications, Telangana KGBVs PGCRTs Recruitment 2018, Kasturba Vidyalayas PGCRTs Recruitment 2018, Kasturba Collges PGCRTs Recruitment 2018 subject wise Qualifications. School Education Department, Govt Of Telangana, Kasturba Gandhi Balika Vidyalaya has given the PGCRT posts recruitment 2018 notification and application are invited from the eligible candidates for filling up the Post Graduate Resident Teacher (PGCRT) posts in the Upgraded KGBVs in the Telangana State. TS KGBVs PGCRT Application Form download from here. 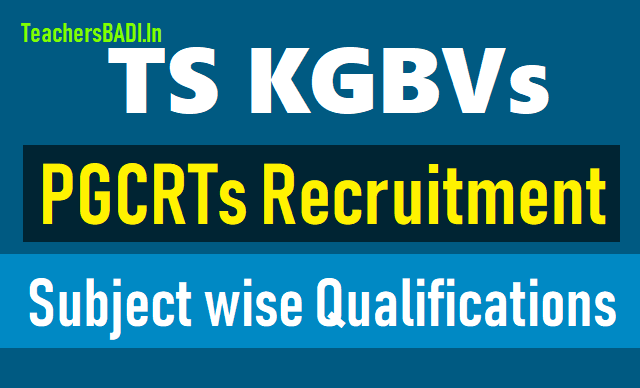 TS KGBVs PGCRTs Recruitment Guidelines, Post wise Qualifications for TS KGBVs PGCRTs, Eligibility Criteria for TS KGBVs PGCRTs and more details are released. ii) Bachelor of Education (B.Ed) or B.A.B.Ed /B.Sc.B.Ed from any institution recognized by NCTE with the subject concerned as a Methodology subject. 6 PGCRT in History M.A. in History/Ancient History and Archaeology Note: Provided these candidates should have studies History as one of the subjects of B.A. Degree level. M.A. Indian Culture of S.V. University/M.A. History, Archaeology and culture of Dravidian University/M.A. Ancient Indian History and Archaeology of S.V. University/M.A. History, Archaeology of Andhra University. Engineering Physics and Instrumentation of Osmania University / M.Sc. (Tech) Co-Physics Note: Provided these candidates should have studied the subject Physics at B.Sc. level. M.Sc. (Technology) Engineering Physics with any specialisation/ M.Sc. (Tech) Instrumentation/ Any Physics based on M.Sc. Course/M.Sc. (Engineering Physics with instrumentation) of Kakathiya University/ M.Sc. (Technical Engineering Physics) of S.V. University / M.Sc. Astro Physics of Osmania University. 9 PGCRT in Botany M.Sc. in Bio Science of Andhra University/Bioloical Sciences of Osmania University/Plant Science of Krishnadevaraya and Osmania University/ Environmental Biology of Nagarjuna University/ Modern Biology of Maratwada University/ Experimental Biology of Saurashtra University/Bio Technology/ Life Sciences of Indore University/ Marine Biology of Andhra University/ Botany/ Micro-Biology Note: Provided these candidates should have studied Botany subject at their graduation level. M.Sc. Life Sciences of Berhampur University provided that the candidates opted for plant sciences in 2nd year/ M.Sc. Plant Science of University of Hyderabad. 2 PG CRT in General Foundation Course Existing Faculty with M.Com/M.A. (Economics) Qualification can be utilized.